New foliage may scorch in full sun locations in hot summer areas, particularly if soils are not kept consistently moist. Mulch helps retain soil moisture and keeps roots cool. Fall color includes shades of yellow, red-purple and bronze. Small reddish flowers in spring are somewhat attractive on close inspection, but are not showy from a distance. 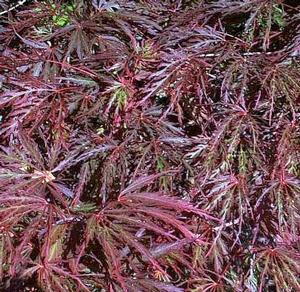 Japanese maples are generally grown for their attractive foliage and shape. As a specimen/accent or group is optimal for around the home, yard, patio or periphery of the border or rock garden. Good sun-dappled understory tree. Somewhat cascading form can be showcased by planting this cultivar near a pond or water garden. Can be effective in containers. Easily grown in moist, organically rich, slightly acidic, well-drained soils in full sun to part shade. Grows well in sandy loams. Pruning is best kept to a minimum, but if needed should be done in late fall to mid-winter. Avoid hot and dry sites.